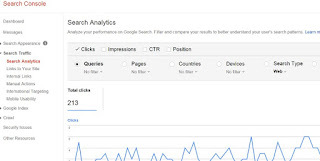 Google search console is a free tool from Google for the webmasters and owner of blogs and websites.Anybody having a free google account can access this awesome tool.Google search console helps the site owners in numerous ways by offering different data and even they send specific warning or messages concerning your website. The first step once logged in to Google search console is to add your website and verify it.Click on "Add a Property"and put your website and click add. Once you added the website, its time to verify your site ownership.There are number of ways to verify site ownership although most preferred method is to add an html code in your website.The verification meta tag must be within the <HEAD> section of the page. Submitting a sitemap help big in crawling the site and its pages.Now your site is verified,its time to add an sitemap.Google support different sitemap formats,XML being the most preferred.From the left navigation bar,click in CRAWL and click on SITEMAP.Now click on red Add/Test sitemap.If you are use the Yoast SEO plugin for WordPress, you’ll enter sitemap_index.xml into the box and click submit. If you want Google to better understand your content like prices, ratings and show rich snippets in search results you can do it by adding an HTML markup for structured data.Visit schema.org for recognized supported schemas for structured data markup. This section consist of three parts. 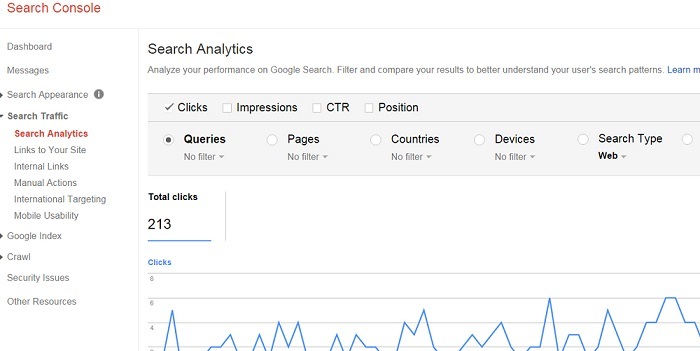 Index status shows you the urls indexed by Google. In Blocked Resources you can see the urls disallowed to crawl in Google by your robots.txt file.Remove Urls shows you the urls you removed. This section is an important tool of the report.Crawl error shows If Google found any difficulty in crawling any of your pages.Craws stats shows crawls data.Using Fetch as Google helps to test how Google crawls or renders a URL on your site,how it renders the page, and whether any page resources (such as images or scripts) are blocked to Googlebot.Robots.txt Tester is a document in main url or root domain that shows the pages or directories that can be or can not be crawled by the search engines.URL Parameters can be used to instruct google to use the preferred version of an URL. If Google find any security issue regarding your website like hacking,malware etc you can see those in this section of Google search console.